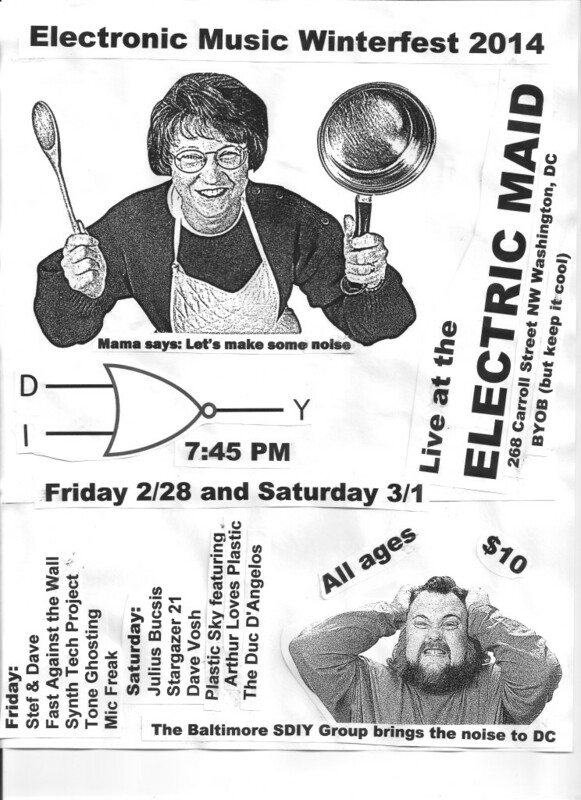 For those of you living in the DC orbit, I’ll be performing with chaotic synthesist extraordinaire, Keith Sinzinger, as “Fast Against The Wall” on Friday, 28 February 2014, in the second slot of the first day of the two-day Baltimore SDIY Group‘s Electronic Music Winterfest at Electric Maid, 268 Carroll Street, Washington DC 20012 (Across from the Takoma Metro Station). The event opens at 7:45 each night, and tickets are just $10, with five diverse and electrifying musical acts in each. Fast Against The Wall is scheduled for the second set of Friday night, and there’s always amazing talent on stage for these events. The music ranges from noisy experimental to smooth dance grooves and whole worlds in-between. I’ve been largely concentrating on beatless, long-form drone and atmosphere music for a while, but this is set to be a playful departure into herky-jerky grooveland and I’m really enthusiastic about the juicy, alien energy we’re conjuring up. I’ll sign your cast and punch your ticket! Next Next post: Working summer becomes performing fall.